In 1994 I started taking clarinet lessons in New York City with master teacher, craftsman and performer Kalmen Opperman. He was a true ‘guru’ for professional clarinetists. Part of Opperman’s discipline was learning how to play a chromatic half-step truly smoothly throughout the instrument. Korsakov’s “Flight of the Bumblebee” is practically all chromatic half steps. From here out I’ll refer to “Flight of the Bumblebee” as The Bumblebee. Now, in 1994 I had two master’s degrees in music and a job as a professional clarinetist. Opperman had a way of cutting you down to fundamental basics. Telling a professional “you can’t play the chromatic scale!” is not an easy pill to swallow. “If you can’t play the half-step, how are you ever going to play another interval well!! !” I thought, I have years of clarinet playing ahead of me, I’m going to work on this. He introduced The Bumblebee to me a few lessons later. I had no interest in learning it. The brief moments I had heard it performed prior to these lessons, I was impressed by the performers speed, but not necessarily how well it was performed. Of course I’m not talking about great performers like Galway or Perlman, those were the models. But, ON CLARINET! Yes, on clarinet! Mr. Opperman quickly would play examples of his students performing The Bumblebee and my jaw dropped. Plus, Opperman would demonstrate his magic on the clarinet often. I had no idea clarinet could be played that fast and well. The goal tempo was quarter note equals 208 (the top of the metronome and means 208 beats per minute). Then, as I would enter the Opperman studio, other clarinetists would finish their lesson and I heard multiple instances and tempos of great chromatic (and all of the other intervals, of course) playing. So, I took the Bumblebee and made it part of my daily study. Opperman worked all of my other imperfections as well. I’d have to say if he were still alive today that I could easily continue study with no end to it or diploma awarded. His discipline lives in me from every moment I put a clarinet together. Do not mistake this posting, Opperman’s teaching was not about speed, it was about beauty. Go back to this statement, “If you can’t play the half-step, how are you ever going to play another interval well!! 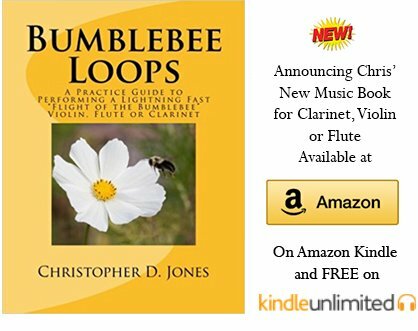 !” You can still play a half-step slowly and bumpy (for clarinetists, just think of the effort it takes to play smoothly over the break from Bb to B-natural). So, we worked many slow passages to gain the beauty of tone between notes of all intervals. Again, that was 1994. I could easily say that I worked on The Bumblebee for a solid year at lower tempos and up to 132. One lesson in 1995, I played The Bumblebee for Opperman. He cocked his head, looked at me and said, “I think you can go to 144.” Believe it or not, it was an exhilarating day for me. I’ve used The Bumblebee as a regular part of my practice maintenance ever since. It usually is a mark of where I am on the clarinet (good or bad). I’ve performed it many times as an encore with clarinet quartet and as a soloist with high school, college and military bands. I reached the magical number of 208, but in my opinion, if you want to play The Bumblebee well at 208, you have to creep the metronome a little higher and then back off to the more comfortable slower tempo of 208. So, I did this. With the age of digital metronomes they reach a top tempo of 250 beats per minute. Over the years, I’d creep it up that high. Honestly, it sounded terrible, but I touched that tempo. I thought it would be fun to make a tutorial hand position video on The Bumblebee. Then, my two gorgeous little girls entered my life. Just prior to their arrival I had made plans to make a clarinet duet video of The Bumblebee. Well, as you can imagine, too many other great life opportunities superseded that video. So, we are back to that moment on the floor with my little girls and me squeaking out The Bumblebee accompaniment. That was easily three years prior to the making of this video. Equipment tests, life challenges and learning curves have delayed until this video. Giraffe went into the studio thinking, I’ll make accompaniment videos at 232, 240, and 252 just in case the clarinetist can’t play the 252 goal. With limited production time, recording 240 and 252 was the only option. With more limited time, processing the 252 video was the only option. Playing 252 was going to have to be it. Now, if you listen to 252 on a metronome, it is so fast you can barely tell what beat is what. Giraffe usually practices his accompaniment at half tempo of 126. Some metronomes still only travel via the old metronome notches, so that old notch of 126 x 2 = 252. Yes, I know the Giraffe Clarinet Bumblebee video is too fast, but I can tell you this, playing the old goal of 208 feels really nice. Here are some of the tools used to make the Giraffe Clarinet Bumblebee video: Giraffe – this is not my daughter’s toy. She practically chewed the squeak out of it. I made a visit to the toy store and play tested at least five Giraffe’s for the best squeak response and tone. GoPro – Hero 3+. This is a fun camera and it is not made for standstill, tripod video. However, in the spirit of GoPro shows a fast performance. Zoom H6 plus Shotgun Microphone – finally after all of these years I found a microphone that I could hook directly into the camera and it sound good. I still have a lot of learning on the audio/video process, though. Buffet R13 Clarinet that Mr. Opperman overhauled. I bought it used from him and is easily over 22-years old. A photograph of this clarinet dons to top of every page of Clarinet-Now.com. Reed – Vandoren 56 Rue Lepic 3.5 . Bumblebee T-shirt - my design from a little doodle. I took an iPhone picture of it, Photoshopped it, and slammed on a t-shirt. Watch it again and share it with the world. Thanks for visiting Clarinet-Now.com.